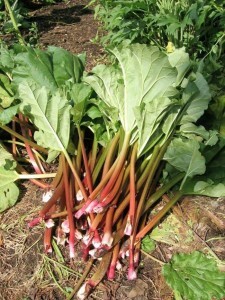 One of the first spring crops growing at Terhune Orchards is Rhubarb. Rhubarb is a beautiful garden plant, with huge lush green leaves and pink or red stalks. It is ready about the same time as strawberries so makes a wonderful combination for desserts. Rhubarb is low in calories, contains potassium, a small amount of vitamin C, and has 2 grams of fiber per cup. Rhubarb is first mentioned in ancient China about 2700 BC. Marco Polo later describes Chinese rhubarb in the accounts of his travels to China. Soon after, Chinese rhubarb found its way into European pharmacies. Rhubarb was planted first in Italy in 1608 and then in other parts of Europe about 20 to 30 years later. By 1778, Europeans were using rhubarb as a filling for tarts and pies. Sometime between 1790 and 1800, rhubarb was brought to the U.S. by an unnamed Maine gardener, who acquired the seed or rootstock from Europe. He introduced it to growers in Massachusetts, where it became popular. By 1822, rhubarb was available in produce markets. Rhubarb is a versatile perennial vegetable that grows well in most of the United States. Only the stalks are edible; the leaves and roots should be discarded. Rhubarb is most commonly used in pies, tarts, and sauces. It is also popular in cakes, pastries, jams, pickles, and wine. Interestingly, the most common ingredient in rhubarb recipes other than rhubarb is strawberry (Terhune Orchards’ strawberries and rhubarb are perfect in a pie). Rhubarb’s mouth-puckering tartness adds zest to these foods. No time to bake? Try our ready-to-eat strawberry rhubarb pie, available in the Farm Store. Rhubarb ripens in mid-May. The more flavorful stalks are likely to be medium-sized and deep red in color. When cooking fresh rhubarb, use a vegetable peeler to remove brown or scaly spots. It is not necessary to peel the entire stalk, just trim the ends and wash and dry the stalks. Always use anodized aluminum, stainless steel, Teflon- coated aluminum or enamel-coated cast iron cookware to cook or bake rhubarb recipes. Because of rhubarb’s high acid content, reactive metal pots (aluminum, iron, and copper) will turn brown. To freeze rhubarb, chop the stalks into 1/2-inch pieces, spread them on a sheet pan, and freeze. Store the frozen pieces in heavy-duty plastic freezer bags. Seal tightly and return to the freezer. Packed this way, rhubarb will keep up to six months. To use, measure out amount needed and return remainder to the freezer. For availability, please call the Farm Store at 609-924-2310. Don’t forget to check out our rhubarb recipes.